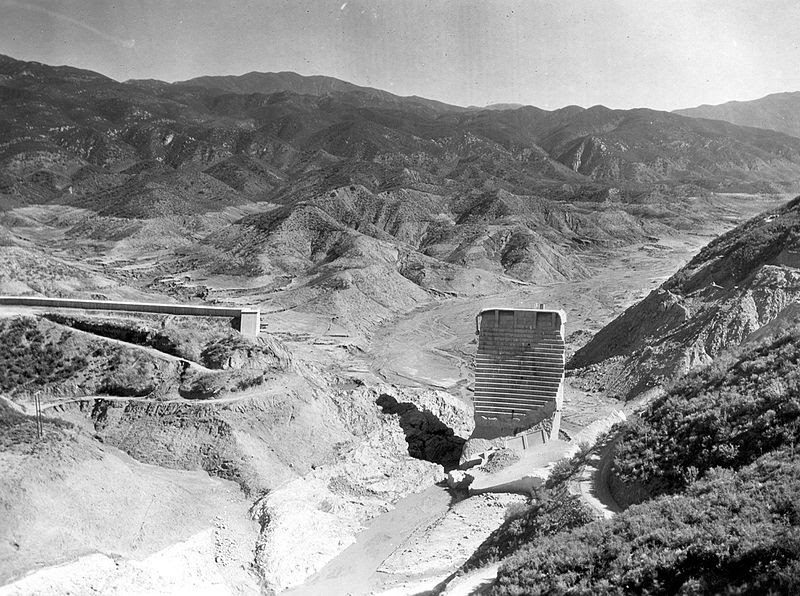 The St. Francis Dam prior to the devastating 1928 collapse that unleashed 12 billion gallons of water, killing more than 400 and wiping out some 1,400 buildings. The collapse of the St. Francis Dam in the wee hours of March 12, 1928, would certainly qualify as one of the largest disasters in our state’s history. An estimated 12 billion gallons of water were unleashed down Los Angeles County’s San Francisquito Canyon to the Santa Clara River in Ventura County and out to the Pacific. In their wake, the waters left more than 400 dead (the exact number never confirmed to this day) and some 1,400 structures wiped out. What happened? 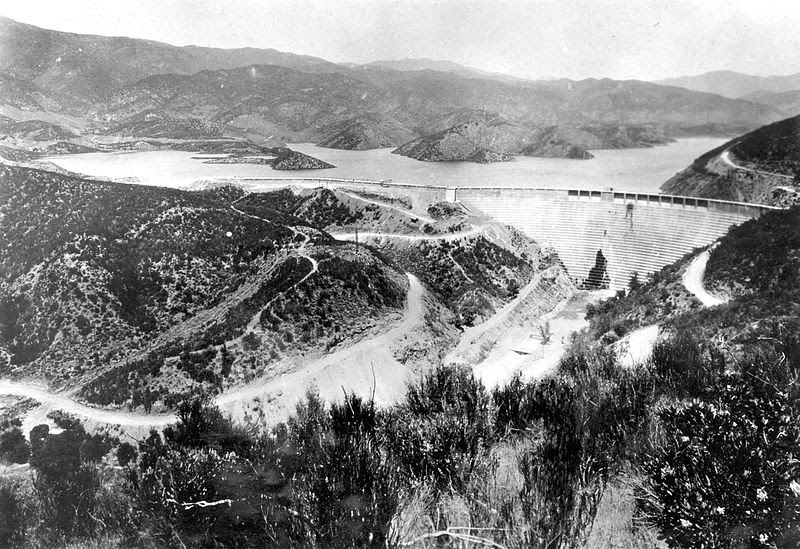 The dam had been finished in 1926, located a few miles northeast of today’s Lake Casitas, as part of the Owens River aqueduct system designed to bring water to the Los Angeles area. The chief engineer of the project was William Mulholland, whose name, of course, is commemorated in a major L.A.-area thoroughfare. The elements conspired to set the stage for the disaster. Heavy rains during fall and winter filled the reservoir and added to the pressure behind the dam. Then construction flaws came into play. The concrete dam had been anchored not in bedrock but in a weaker anchor of shale. The lower reaches of the dam were the first to go. There had been warnings. The caretaker of the dam called attention to the fact that the lower areas upon which the dam was anchored were mushy and that some leaks were appearing. These warnings went unheeded. The east side of the dam went first; the western third followed almost immediately. Full collapse probably took under a minute. Within five minutes, a powerhouse about a mile and a half downstream was destroyed, taking 35 people with it. The wall of water, about 100 feet high, continued on its destructive path. The deluge, picking up more and more debris as it roared ocean-ward, then turned into the Santa Clara River bed. A little over 30 minutes after the collapse, the wall of water, still more than 50 feet in height, slammed into and wiped out the Saugus station of the Edison Power Company. An auto camp near Castaic Junction disappeared with a good chance none of the occupants even woke up. A few miles downriver, an estimated 85 employees in an Edison work camp drowned. Piru was next. Those near the river bed died, and as the onrushing waters continued, the concern became the debris they carried ​— ​boulders, buildings, trees, power poles, corpses. Twenty-five-foot waves carried a good part of Santa Paula with them, and then, about five hours after the dam collapse, the waters with their deadly cargo reached the sea. It could have been even worse, but warnings had allowed hundreds to escape the rampaging floodwaters. Still, the destruction is almost unimaginable today given the loss of life and some 24,000 acres of farm and ranch land washed away. Fifty years later, bodies from the disaster were still being unearthed. In the aftermath, hearings were held, grand juries called. Ultimately, the Los Angeles Department of Power and Light paid out close to $7 million in damages, although there was also an attempt at a cover-up concerning details of the disaster. What couldn’t be covered up were the memories of those who lived through it. As one Santa Paula resident remembered, “Then, all of sudden, I could hear it. A distant rumble; it came closer and became more of a roar. Suddenly it hit the Santa Paula Bridge like a crash of thunder.” Thelma McNabb was one of the lucky ones; she lived to tell her story. Hundreds of others were not so fortunate. Michael Redmon is the director of research at the Santa Barbara Historical Museum.